Gov. Akinwunmi Ambode of Lagos State on Friday urged the National Assembly to identify and address provisions in the 1999 Constitution that had become stumbling blocks in the spirit of true federalism. Ambode made the remark in Lagos, at a joint working retreat of members of the Senate and House of Representatives Committees on the Review of the 1999 Constitution. He cited issues to be considered by the joint committee to include devolution of powers, Land Use Act, state policing, a review of the revenue allocation formula and according Lagos State a special status. The governor said this was necessary in the country’s quest to fully realise its potentialities in all sectors of the economy. He wondered why states should be precluded from performing several important constitutional responsibilities. “Why does the Federal Government hold legislative and executive powers on matters of local concern which over-stretch its administrative and supervisory abilities? “Why should the Land Use Act, NYSC Act, Code of Conduct Act form part of the Constitution? “Should we not have a sharing formula that ensures that states and local government councils are empowered to discharge their constitutional responsibilities? “We need to be truthful and frank about fiscal federalism. “Should the constitution not confer power on State Houses of Assembly to establish state police, with clear jurisdiction and well-articulated protocols for the regulation of its relationship with the federal police? Ambode queried. The governor described operation of a Land Registry by the federal government in Lagos as an aberration and said the proposed Stamp Duty Bill would cripple internally generated revenue due to the states. “The Bill is presently before the National Assembly, and it is a grave threat to the principles of fiscal federalism. “As representatives of the true beneficiaries of the Act, as it presently stands, there is need to put an urgent end to its further coordination by the National Assembly, which also has the noble tradition that once a matter is before the court, all activities on the matter will be suspended,” he said. According to him, the State Government has approached the Supreme Court on the matter. 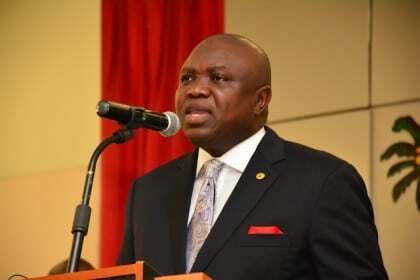 Ambode commended the ongoing process by the legislature to review the constitution. Earlier, the Deputy Senate President, Sen. Ike Ekweremadu, expressed optimism that at the end of the retreat, working solution would have been proffered to majority of the issues that would be raised.